I was wondering about the lack of comments to my blog entries, so I tried adding one myself and found I couldn't. I fixed the bug today so it should all be working fine now. My apologies to anyone who had previously tried to post a comment but was unsuccessful. Please feel free to post a comment now (if only to check it works!). This is my first blog entry. 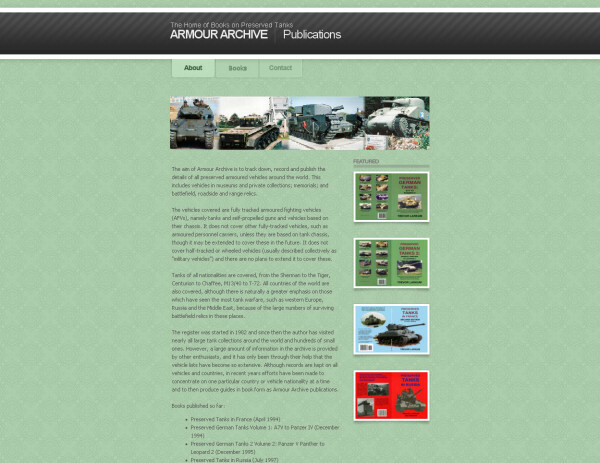 Having overhauled Armour Archive I have now embarked on the much more ambitious project of creating PreservedTanks.com. After much jumping between hosting providers and technologies, I have settled down to build an ASP.NET site using Microsoft Visual Web Developer, and hosted by eUKHost.com. For now I'm just trying to learn the technologies, particularly using a SQL Server back end to hold the data.